boy do we have some outstanding samples to get you inspired. I wanted to do something with non-traditional Christmas colors. Couldn’t seem to get a great photo of this card for some reason…so I had to settle for this one! I have stickles in the centers of my flower images, but you can’t tell! I used a sheet of vellum for my ornament and heat embossed it with some white embossing powder. The rest doesn’t really need much explanation…it came together very quickly! The sentiment is from Gina K.
the other design team members came up with. Or you can visit each of my fellow DT peeps this way! Oh and we always have a prize for you…. I am also linking this up to the Merry Monday July Christmas Challenge! You have plenty of time to join me here is well it’s a month long this time! Either way I sure hope you join me for these Christmas in July specials! Categories: Cards, challenges | Tags: Card making, Cards, Christmas, embossing, rubber stamps, stamping, vellum | Permalink. Love that vellum ornament. Thanks for joining us at Merry Monday! Fabulous Christmas card! 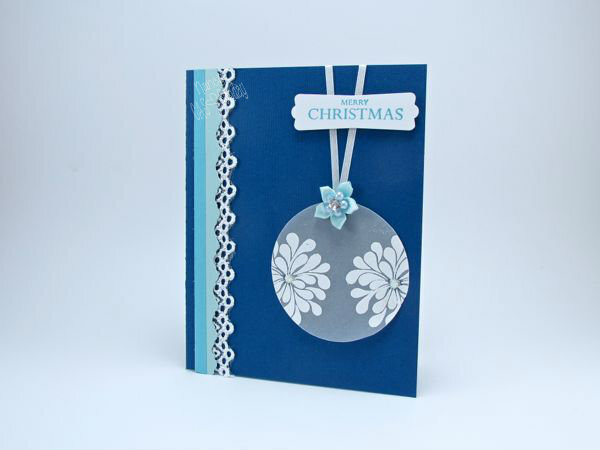 I love the blue scheme and of course the pretty ornament! Wow, Nancy. Making the ornament out of vellum gives it the look of real glass. Thanks Bobby…I so appreciate it! Oh, this is a fantastic card. I love blue Christmas cards. I’m going to have to check this challenge out! What a beautiful, vellum ornament! Love the dark blue and white! Thanks so much for sharing this with us at Merry Monday! This is absolutely beautiful Nancy. I love it! Very pretty card, I love your ornament. Great image you’ve embossed on that ornament. Reminds me of some ornaments my folks had. Love your ornament! Thanks for playing with us at Merry Monday!